Named one of the "juiciest political books to come in 2018" by Entertainment Weekly. 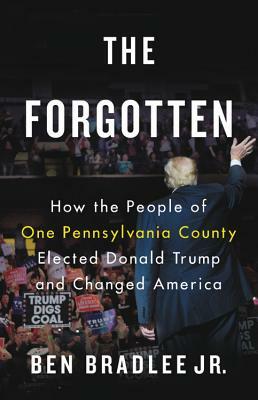 In The Forgotten, Ben Bradlee Jr. reports on how voters in Luzerne County, a pivotal county in a crucial swing state, came to feel like strangers in their own land - marginalized by flat or falling wages, rapid demographic change, and a liberal culture that mocks their faith and patriotism. Fundamentally rural and struggling with changing demographics and limited opportunity, Luzerne County can be seen as a microcosm of the nation. In The Forgotten, Trump voters speak for themselves, explaining how they felt others were 'cutting in line' and that the federal government was taking too much money from the employed and giving it to the idle. The loss of breadwinner status, and more importantly, the loss of dignity, primed them for a candidate like Donald Trump. Ben Bradlee Jr. is the author of the critically acclaimed The Kid: The Immortal Life of Ted Williams (2013) among other books. Bradlee spent 25 years with The Boston Globe as a reporter and editor. As deputy managing editor, he oversaw the Globe's Pulitzer Prize-winning coverage of the sexual abuse scandal in the Catholic Church from July 2001 to August 2002. Bradlee lives with his wife outside Boston.